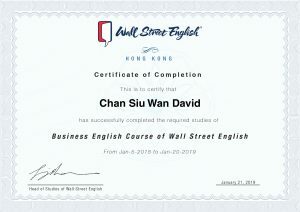 The Wall Street English (WSE) Business English course offers a comprehensive course for business professionals. With the aim of improving your Business English level, the course will focus on developing different soft skills such as writing, communications, presentation and negotiation skills. You will learn new vocabulary related to common workplace themes and specific industries and the class will be taught with rich content using different teaching methods such as business writing exercises, case studies and group discussions. In conjunction with our General English course, WSE Business English course will equip you with the English language skills needed to improve your personal performance, advance your career and succeed in the workplace. The Business English course also utilizes the Wall Street English Learning Method , with content that is used by Wall Street English all over the world. Our General English course can help build your foundation in English grammar and sentence structures and you can join different activities at our centers to practice English usage. With all of these tools at your disposal, our Business English Course can help you to practice and improve your English in different business scenarios. The course will help you become a more confident English speaker, enabling you to succeed in the business world. Writing in a business context will allows you to improve your business correspondence in key areas such as emails, letters, action minutes, and many others. By focusing on vocabulary, fluency and grammar, you will learn how to write more persuasively based on common workplace topics. Our course offers a chance for you to improve the way you communicate with colleagues and customers face-to-face, and for you to become more confident in how to speak convincingly. Enhance your meeting management skills with skills about positively influencing the situation to ensure the successful execution of a meeting. Acquire the skills to express ideas, manage meeting time and summarize the main points of a meeting. Improve your negotiation skills with new techniques and in conjunction with learning more vocabulary to contribute to the successful outcome of negotiations. For example, how to make offers, closing the deal, and others. Learn how to plan, structure and hold successful oral presentations, and present ideas and thoughts convincingly to listeners. The course offers many more Business English skills, and it is not limited to above. Enhance your soft skills needed in a business context. With a variety of business vocabulary, phrases and idioms collected from different industries, students can express themselves more precisely and effective in different business situations (day-to-day business English, managing meetings, presentations, negotiating, networking, etc.). Extracted from the renowned publication “Financial Times”, and with the combination of face-to-face teaching settings with native English teachers, students will be applying the business vocabulary and phrases learnt from the class in a stimulating business environment. The course is comprised of many real-world business case studies, that students will be practicing through business role-play speaking exercises, group discussions and business writing exercises. Developed in association with Financial Times content, WSE Business English course materials introduces students to topical business issues to help build the professional language and communication skills required for the daily workplace. This practical curriculum aids to raising student awareness of the fast changing business world and how to go forth in this ever changing world. Please contact a Wall Street English Education Consultant today! *Terms & Conditions: For Business English Course, a minimum of 12 units and at least 80% attendance is required. Including unlimited social club activities. Course duration: depending on student’s English level and their needs.